The term tubulointerstitial is used to broadly refer to kidney diseases that involve structures in the kidney outside the glomerulus. These diseases generally involve tubules and/or the interstitium of the kidney and spare the glomeruli, as shown in the image below. Kidney biopsy. This is an example of acute interstitial nephritis. The renal cortex shows a diffuse interstitial, predominantly mononuclear, inflammatory infiltrate with no changes to the glomerulus. Tubules in the center of the field are separated by inflammation and edema, as compared with the more normal architecture in the right lower area (periodic acid-Schiff, 40 X). Although primary glomerular diseases are often associated with prominent tubulointerstitial changes (see the following image), the clinical presentation is dominated by the consequences of glomerular injury; hence, they are not considered in this article. Kidney biopsy in interstitial nephritis. Acute crescentic glomerulonephritis. The glomerular tuft is compressed by the proliferation of epithelial cells, forming a crescent. The interstitium shows mononuclear inflammatory infiltrate and edema (periodic acid-Schiff, 40 X). The authors suggest the reader see the Mayo Clinic - Kidney Transplant Information Website for further information. For patient information, see Chronic Kidney Disease, and Kidney Transplant. See also Glomerulonephritis, Membranoproliferative Glomerulonephritis, Pediatric Nephritis, and Radiation Nephritis. 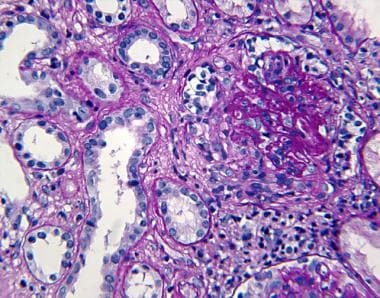 Tubulointerstitial nephritis involves the immune-mediated infiltration of the kidney interstitium by inflammatory cells. Lethal or sublethal injury to renal cells leads to expression of new local antigens, inflammatory cell infiltration, and activation of proinflammatory and chemoattractant cytokines. These cytokines are produced by inflammatory cells (ie, macrophages, lymphocytes) and also by the renal cells (ie, proximal tubule, vascular endothelial cells, interstitial cells, fibroblasts). The outcome can be acute or chronic nephritis. The principal mechanism in acute tubulointerstitial nephritis is hypersensitivity reaction to drugs such as penicillins, nonsteroidal anti-inflammatory drugs (NSAIDs), and sulfa drugs. Another mechanism is acute cellular injury caused by infection, viral or bacterial, often associated with obstruction or reflux. The kidney is remarkably resistant to structural damage in bacterial infections, and, in the absence of obstruction, damage from bacterial infection in the kidney parenchyma is extremely unlikely to occur. Studies have revealed transforming growth factor–beta (TGF-β) as a major participant in fibrogenesis. TGF-β favors accumulation of collagen and noncollagen basement membrane components by direct stimulation of production and by inhibiting matrix degradation enzymes such as collagenases and metalloproteinases. Activation of nuclear transcription factors, such as nuclear factor kappa B (NFκB) in injured kidney cells,  with consequent transcription and release of proinflammatory cytokines into the interstitium, appears to be a major mechanism of chronic tubulointerstitial inflammation accompanying proteinuric kidney diseases. Tubulointerstitial diseases of the kidney encompass diverse etiologies and pathophysiologic processes, and the patient can present with acute or chronic conditions. Many forms of tubulointerstitial injury involve exposure to drugs or other nephrotoxic agents such as heavy metals and, rarely, infection. By far the most common form of tubulointerstitial inflammation is hypersensitivity reaction to medications, termed allergic interstitial nephritis. Environmental and occupational exposure to lead can cause chronic tubulointerstitial nephritis. Occupations in welding, smelting, the battery industry, and mining have all been responsible for lead nephropathy cases. Environmental exposure from leaded gasoline is decreasing, because the use of leaded gasoline has ceased in the United States; however, sporadic exposure is still observed, particularly among children living in deteriorating housing in urban areas. Rarely, lead poisoning can be observed among individuals who consume moonshine whiskey and those who drink beverages from imported ceramics painted with leaded glaze. A variety of causes contribute to obstructive uropathy, including prostate disease in elderly males; pelvic or colonic tumors involving both ureters in both sexes; nephrolithiasis, with or without urinary tract infection; and radiation to the pelvic area as well as some drugs, such as methysergide, can cause retroperitoneal fibrosis and obstruction. A study by Maripuri et al found that of 24 patients with primary Sjögren syndrome who also had renal impairment, biopsies revealed that 17 individuals had tubulointerstitial nephritis as the primary lesion behind their kidney dysfunction,  and 11 of the 17 patients had the chronic form of this nephritis. The investigators suggested these results support the notion that in patients with primary Sjögren syndrome, chronic tubulointerstitial nephritis is the most frequent cause of renal impairment found through kidney biopsy. In the early 1990s, aristolochic acid was recognized as a potent nephrotoxin that can cause rapidly progressive interstitial fibrosis and end-stage renal disease (ESRD) in young women using a Chinese herb as part of a slimming regimen in Belgium. Since then, many other cases of so-called Chinese herb (CH) nephropathy have been reported from around the world. Chinese herb nephropathy may not be an appropriate name for the disease, however, because aristolochic acid can be present in herbal medicines from any country. The term aristolochic acid nephropathy (AAN) more accurately characterizes this form of toxic nephropathy. Neither acute nor chronic tubulointerstitial diseases of the kidney demonstrate racial predilections. However, lead nephropathy may be more common in black people because of socioeconomic factors. Analgesic nephropathy is 5-6 times more common in women. This is generally attributed to women taking more analgesics than men. However, a greater sensitivity to the toxic effects of analgesics or differences in analgesic metabolism in women cannot be ruled out. All toxic nephropathies are related to the cumulative effects of toxic substances, particularly lead, and consequently are likely to be observed more frequently with advancing age. However, this is highly variable. For example, people with severe lead poisoning during childhood may present with chronic tubulointerstitial nephritis in early adult life. Atherosclerotic and/or ischemic kidney disease is increasingly more common in elderly individuals. Metabolic disorders, such as cystinosis, oxalosis, and hypercalcemia, can occur in younger individuals. Hypertension may also complicate any renal disease, but not all cases of interstitial renal disease are associated with hypertension (ie, Balkan endemic nephropathy, acute allergic interstitial nephritides). Most patients with allergic interstitial nephritis recover renal function upon cessation of the offending agent. Patients with cholesterol microembolic kidney disease often have some spontaneous improvement in renal function after the embolic event. Complete resolution of renal insufficiency is rare, however. Although the natural history of chronic tubulointerstitial nephritides varies depending on the etiology, most chronic tubulointerstitial renal disease eventually progresses to ESRD. However, the rate of progression is generally believed to be much slower in tubulointerstitial nephritis compared to glomerular diseases. Joyce E, Glasner P, Ranganathan S, Swiatecka-Urban A. Tubulointerstitial nephritis: diagnosis, treatment, and monitoring. Pediatr Nephrol. 2017 Apr. 32 (4):577-587. [Medline]. Harris RC, Neilson EG. Toward a unified theory of renal progression. Annu Rev Med. 2006. 57:365-80. [Medline]. Liu Y. Renal fibrosis: new insights into the pathogenesis and therapeutics. Kidney Int. 2006 Jan. 69(2):213-7. [Medline]. [Full Text]. Rangan GK, Wang Y, Tay YC, Harris DC. Inhibition of nuclear factor-kappaB activation reduces cortical tubulointerstitial injury in proteinuric rats. Kidney Int. 1999 Jul. 56(1):118-34. [Medline]. De Broe ME, Elseviers MM. Over-the-counter analgesic use. J Am Soc Nephrol. 2009 May 7. [Medline]. Slade N, Moll UM, Brdar B, et al. p53 mutations as fingerprints for aristolochic acid: an environmental carcinogen in endemic (Balkan) nephropathy. Mutat Res. 2009 Apr 26. 663(1-2):1-6. [Medline]. [Full Text]. Karmaus W, Dimitrov P, Simeonov V, et al. Offspring of parents with Balkan Endemic Nephropathy have higher C-reactive protein levels suggestive of inflammatory processes: a longitudinal study. BMC Nephrol. 2009 Apr 28. 10:10. [Medline]. [Full Text]. Maripuri S, Grande JP, Osborn TG, et al. Renal involvement in primary Sjögren''s syndrome: a clinicopathologic study. Clin J Am Soc Nephrol. 2009 Sep. 4(9):1423-31. [Medline]. [Full Text]. Jain A, Srinivas BH, Emmanuel D, Jain VK, Parameshwaran S, Negi VS. Renal involvement in primary Sjogren's syndrome: a prospective cohort study. Rheumatol Int. 2018 Aug 23. [Medline]. De Broe ME. Chinese herbs nephropathy and Balkan endemic nephropathy: toward a single entity, aristolochic acid nephropathy. Kidney Int. 2012 Mar. 81(6):513-5. [Medline]. Salvadori M, Tsalouchos A. Immunoglobulin G4-related kidney diseases: An updated review. World J Nephrol. 2018 Jan 6. 7 (1):29-40. [Medline]. [Full Text]. Saeki T, Nishi S, Imai N, Ito T, Yamazaki H, Kawano M, et al. Clinicopathological characteristics of patients with IgG4-related tubulointerstitial nephritis. Kidney Int. 2010 Nov. 78(10):1016-23. [Medline]. McMahon BA, Novick T, Scheel PJ, Bagnasco S, Atta MG. Rituximab for the Treatment of IgG4-Related Tubulointerstitial Nephritis: Case Report and Review of the Literature. Medicine (Baltimore). 2015 Aug. 94 (32):e1366. [Medline]. [Full Text]. Inoue D, Yoshida K, Yoneda N, Ozaki K, Matsubara T, Nagai K, et al. IgG4-related disease: dataset of 235 consecutive patients. Medicine (Baltimore). 2015 Apr. 94 (15):e680. [Medline]. [Full Text]. Mackensen F, Billing H. Tubulointerstitial nephritis and uveitis syndrome. Curr Opin Ophthalmol. 2009 Sep 11. [Medline]. Patel S, Hossain MA, Ajam F, Patel M, Nakrani M, Patel J, et al. Dabigatran-Induced Acute Interstitial Nephritis: An Important Complication of Newer Oral Anticoagulation Agents. J Clin Med Res. 2018 Oct. 10 (10):791-794. [Medline]. [Full Text]. Clive DM, Vanguri VK. The Syndrome of Tubulointerstitial Nephritis With Uveitis (TINU). Am J Kidney Dis. 2018 Jul. 72 (1):118-128. [Medline]. Kanno H, Ishida K, Yamada W, Shiraki I, Murase H, Yamagishi Y, et al. Clinical and Genetic Features of Tubulointerstitial Nephritis and Uveitis Syndrome with Long-Term Follow-Up. J Ophthalmol. 2018. 2018:4586532. [Medline]. [Full Text]. Border WA, Holbrook JH, Peterson MC. Gallium citrate Ga 67 scanning in acute renal failure. West J Med. 1995 May. 162(5):477-8. [Medline]. Linton AL, Richmond JM, Clark WF, Lindsay RM, Driedger AA, Lamki LM. Gallium67 scintigraphy in the diagnosis of acute renal disease. Clin Nephrol. 1985 Aug. 24(2):84-7. [Medline]. Hettinga YM, Scheerlinck LM, Lilien MR, Rothova A, de Boer JH. The value of measuring urinary β2-microglobulin and serum creatinine for detecting tubulointerstitial nephritis and uveitis syndrome in young patients with uveitis. JAMA Ophthalmol. 2015 Feb. 133 (2):140-5. [Medline]. Shi Y, Su T, Qu L, Wang C, Li X, Yang L. Evaluation of urinary biomarkers for the prognosis of drug-associated chronic tubulointerstitial nephritis. Am J Med Sci. 2013 Oct. 346(4):283-8. [Medline]. Quinto LR, Sukkar L, Gallagher M. The effectiveness of corticosteroid compared to non-corticosteroid therapy for the treatment of drug-induced acute interstitial nephritis: A systematic review. Intern Med J. 2018 Aug 21. [Medline]. Lin JL, Lin-Tan DT, Hsu KH, Yu CC. Environmental lead exposure and progression of chronic renal diseases in patients without diabetes. N Engl J Med. 2003 Jan 23. 348(4):277-86. [Medline]. Lin JL, Lin-Tan DT, Yu CC, Li YJ, Huang YY, Li KL. Environmental exposure to lead and progressive diabetic nephropathy in patients with type II diabetes. Kidney Int. 2006 Jun. 69(11):2049-56. [Medline]. Kidney biopsy. 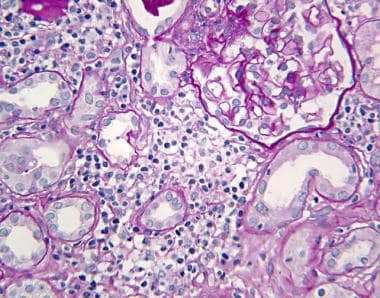 Shown here is an example of acute interstitial nephritis. The diagnosis is based on the active inflammatory infiltrate on the right with unaffected glomeruli. Interstitial edema and fibrosis are present on the left side of the field, where some tubules show thickened basement membrane (hematoxylin and eosin, 20 X). Kidney biopsy. This image shows acute interstitial nephritis. The interstitium is expanded by mononuclear inflammatory infiltrate and edema. Acute tubular damage is present; some tubules are distended and contain granular casts (hematoxylin and eosin, 40 X). Kidney biopsy. This image shows acute interstitial nephritis. The mononuclear inflammatory infiltrate contains abundant eosinophils, suggesting an allergic etiology. Severe tubular damage is observed (hematoxylin and eosin, 40 X). Kidney biopsy. This image shows acute interstitial nephritis. The inflammatory infiltrate forms an ill-defined granuloma, suggesting allergic or infectious etiologies. A partially destroyed tubule is present (periodic acid-Schiff, 40 X). Kidney biopsy. This image shows chronic tubulointerstitial nephritis. The interstitium is expanded by fibrosis, with distortion of tubules and periglomerular fibrosis. Glomeruli do not show pathologic changes (hematoxylin and eosin, 20 X). Kidney biopsy in interstitial nephritis. This image shows a cholesterol microembolism. The 2 arterioles in the center are occluded by elongated crystals (hematoxylin and eosin, 20 X). Kidney biopsy in interstitial nephritis. This image shows a cholesterol microembolism. The arteriole in the center of the field has a thickened wall. The lumen is occluded by elongated spaces, corresponding to dissolved crystals surrounded by cellular reaction. The 2 glomeruli flanking the arteriole are sclerotic and hardly recognizable (hematoxylin and eosin, 40 X). We wish to thank Suzanne Meleg-Smith, MD, for her previous contributions to this article.